My thanks go to Alan Curtis who kindly allowed me to use and prepare his original scanned negatives during the preparation of this illustrated article and also for passing on his notes and personal memories from that period. 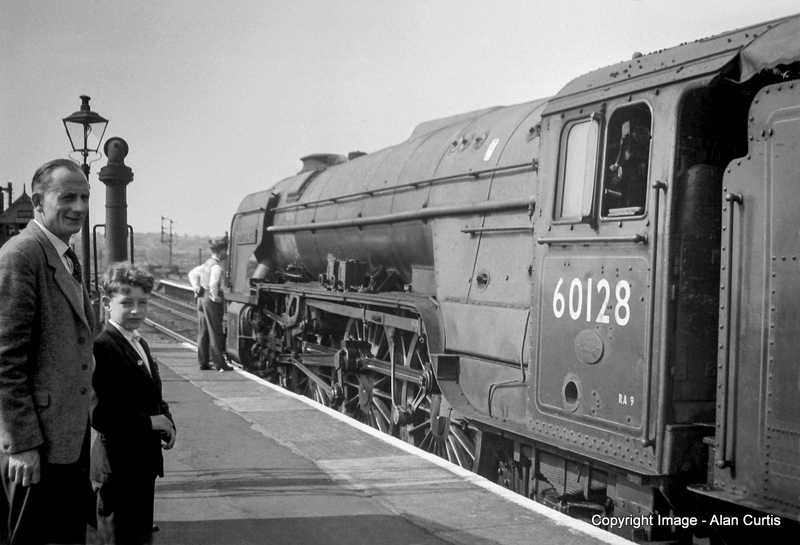 When I was a fairly young boy, one of my earliest memories was hearing and watching steam trains as they passed along the Boston to Spalding line which was situated only a short distance from my parents' house. 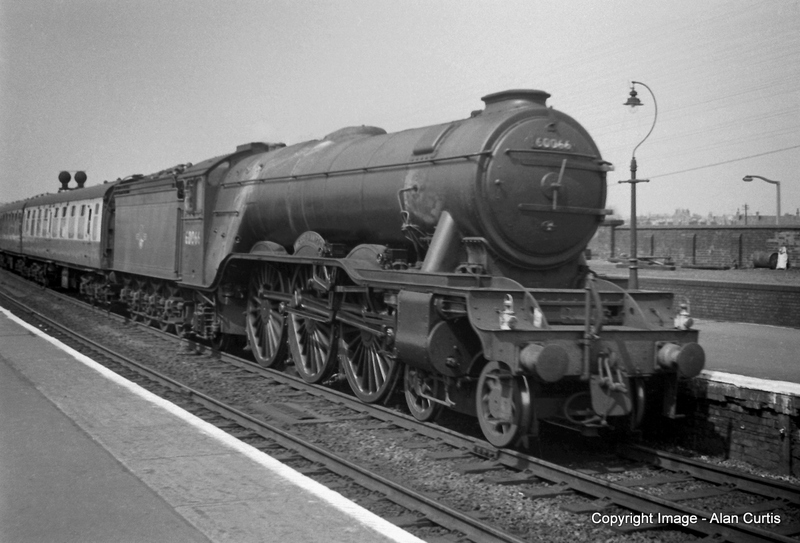 It was some years later, in fact after I had started at secondary school, that I think I really became interested in spotting locomotives. Several of my classmates at school were already avid number takers, so I began to follow suit. An occasional distraction during lessons was caused by the fact that it was quite easy for us to watch them from our classroom and of course more closely from the playing fields at lunch times. Gradually over a period of time I became more knowledgeable and with help from information contained within the pages of my Ian Allan ABC and of course assistance from my school friends, I began to recognise the different classes and wheel arrangements. 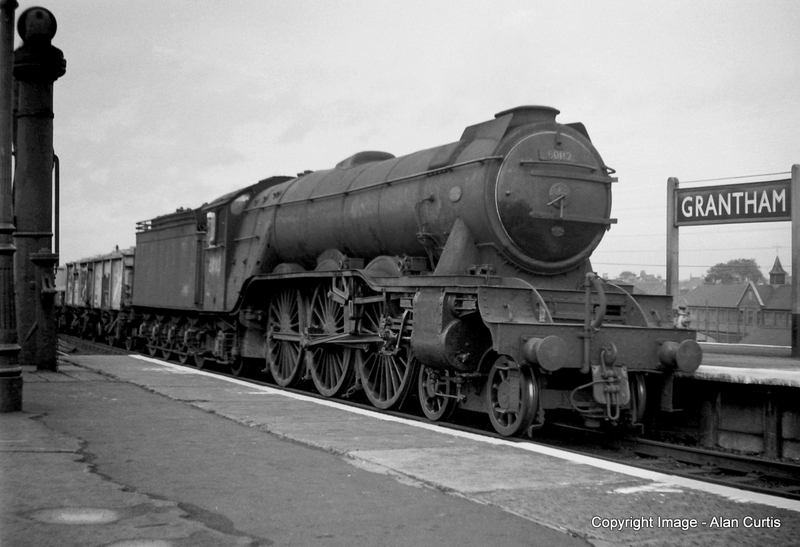 I also learnt that it was possible to determine the regional origin of a locomotive by its number. 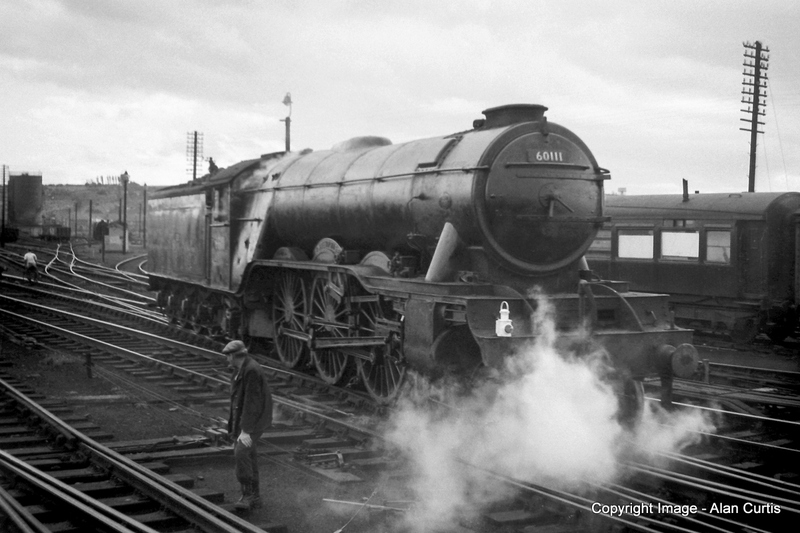 For example loco numbers starting with a 4 were mostly from the Midland while those starting with a 6 from the Eastern. 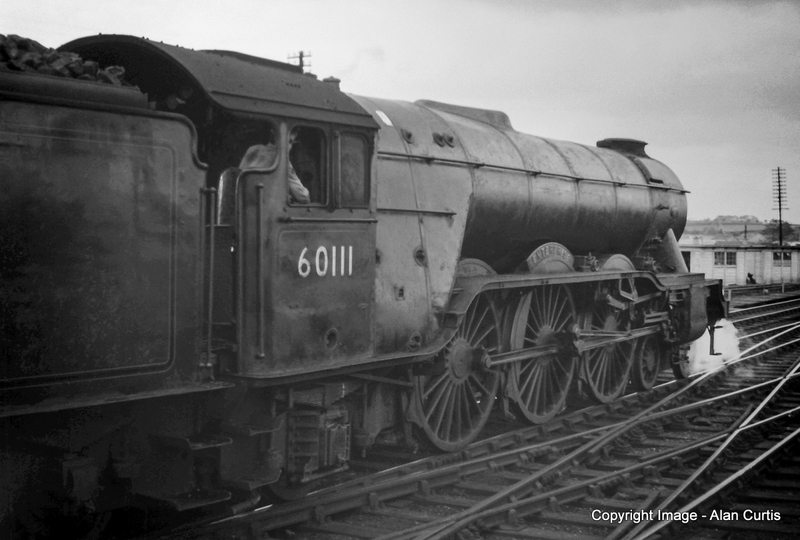 Other numbers such as 7 or 9 indicated that the locomotive was of a ‘Standard’ design and could be seen almost anywhere throughout the system. My school days had provided me with a good education, not only the 3 R’s but a 4th R, Railways! After leaving school and starting work and thus having a little money, this gave me the opportunity to purchase a bicycle. Having a bicycle opened up new horizons and allowed my friend and I to cycle the 6 miles or so to the M&GN Joint line at Gosberton in the evenings. This line was extremely busy at that time of the day and yielded some different classes, like V2s and NER B16s, etc. After many visits to the M&GN we decided that we wanted to go further afield and see some of the more glamorous engines. Getting ever more adventurous, we planned a longer cycle trip of around 30 miles to the main line at Grantham. 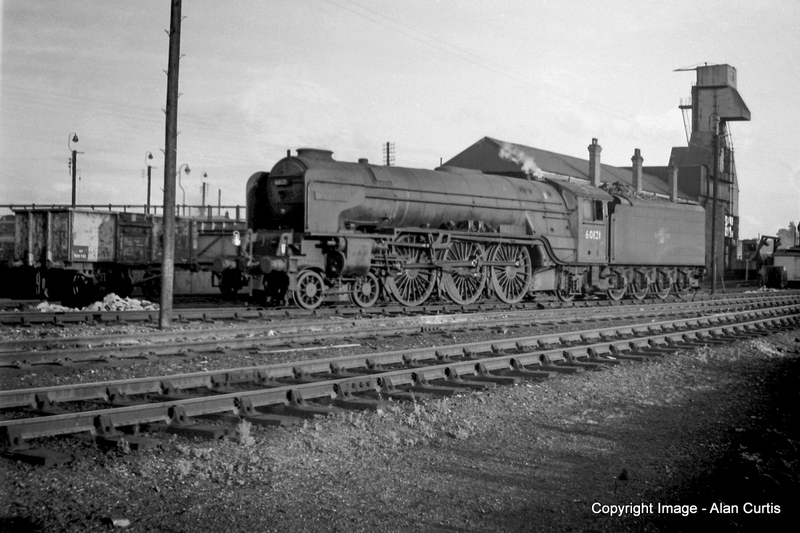 We had heard that Grantham was a good place for spotting with a variety of locomotives from the north regularly coming off here to hand over to local engines. My friend and I did this particular Grantham trip several times. My cousin and I later became regular spotting companions and after we both acquired motorcycles, trips to the Grantham area became much easier. Another benefit of owning a motorcycle meant that we were able to travel even further and see other 'foreign' locations, neglecting the local area for a while before later returning to the main lines running north and south of Grantham. Our favourite locations were Great Ponton, Stoke Tunnel and Stoke Summit. We also spent many happy hours in the signal box at Great Ponton. Just a little further south of Great Ponton, Peterborough became a firm favourite for us as we could travel on the Cleethorpes-King's Cross expresses from Boston then take the return working back home. 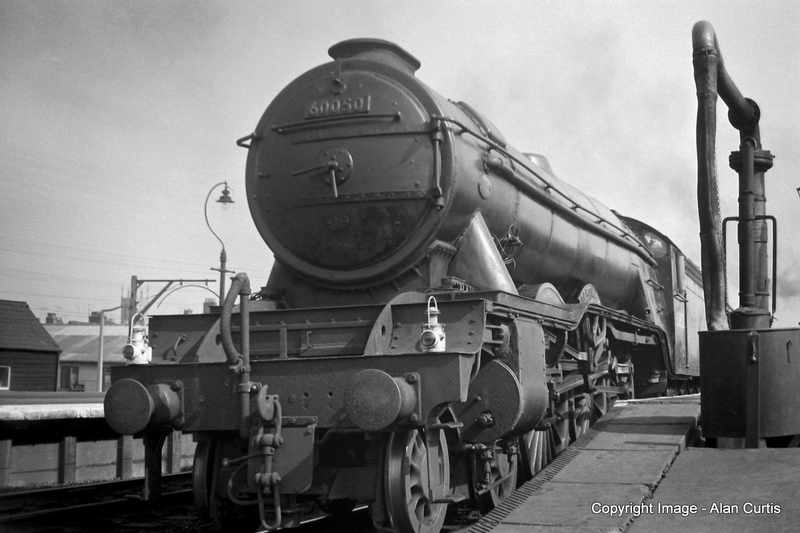 My interest eventually spread to the whole of the British Railways system and then, after the demise of steam, to many European destinations including Canada and the USA. 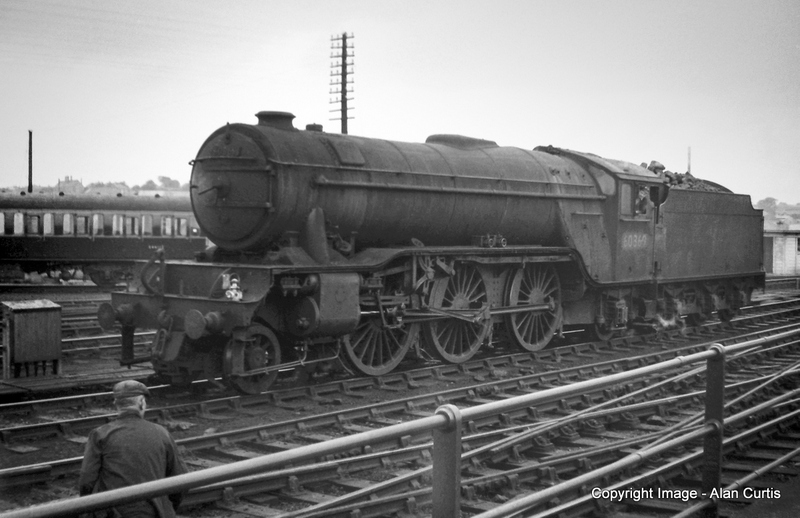 Looking back, my love of steam originates mainly from those glorious days spent at the trackside north and south of Grantham on the East Coast Main Line. 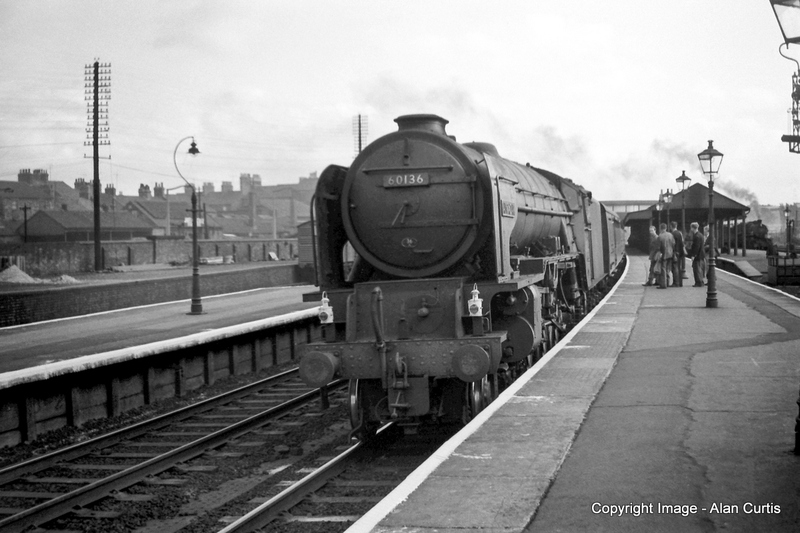 Luckily I still have my own small photographic record of two of my memorable trips to Grantham Station, Saturday 13th May 1961 and Thursday 28th September 1961. A view looking back along the platform at the north end of the station. 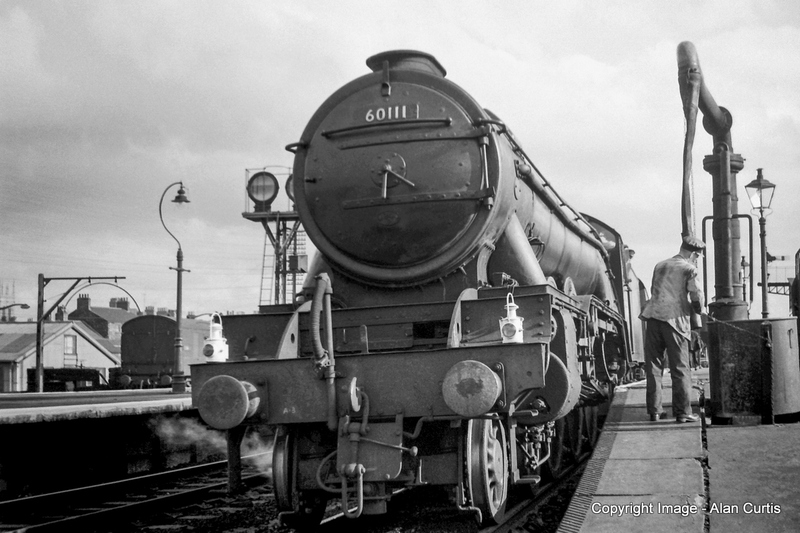 The crew of 60107 'Royal Lancer' take a few brief moments to chat before moving off with with an express for the north. A different vantage point with a low level shot of A3 No 60050 'Persimmon' towering over me at the north end of Grantham Station. 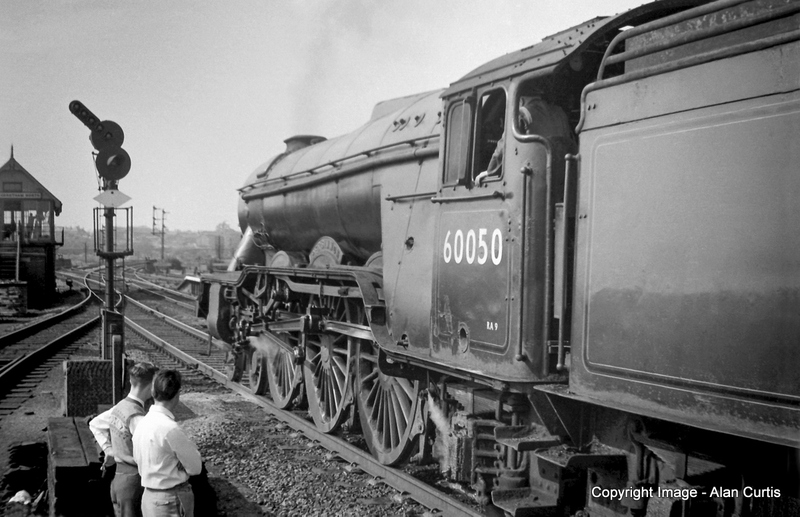 I've moved back up to the platform and taken another photograph of A3 No 60050 'Persimmon' just as the loco finally moves off for the north. The two gentlemen watching the train depart portray the relaxed but responsible attitude shown by most enthusiasts of the day. Note the traditional 'Fair Isle' short sleeved jumper and contrasting hair styles, soon to change with the advent of the Beatles the following year. I'm now at the south end of the station and just in time to capture A1 No 60119 'Patrick Stirling' at speed with a northbound express. 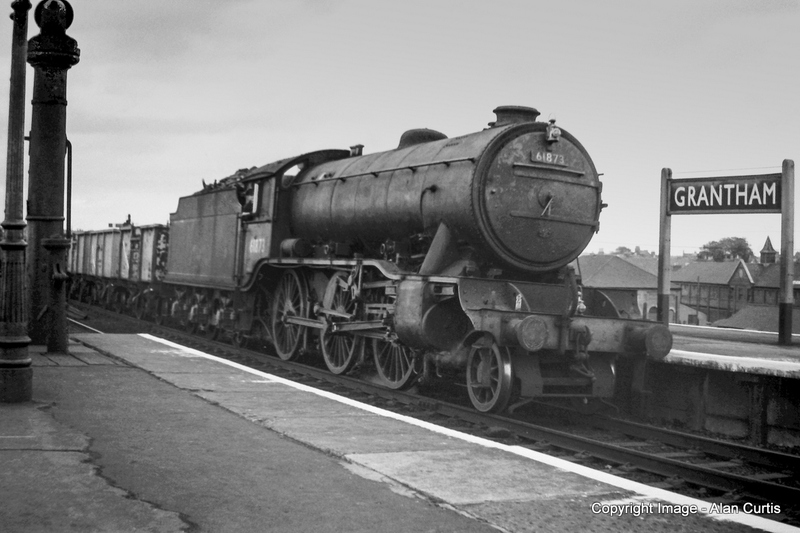 With 'Patrick Sterling' safely recorded on film and probably nearing Peascliffe Tunnel to the north, I turn my attention to A1 No 60158 'Aberdonian' slowing to a halt with an Up express. After a stop adjacent to the Yard Box A1 No 60158 'Aberdonian' moves off southbound past the old Granary. I'm just on my way back up to the north end of the station when I encounter A3 No 60066 'Merry Hampton' slowing for a stop with an Up express. 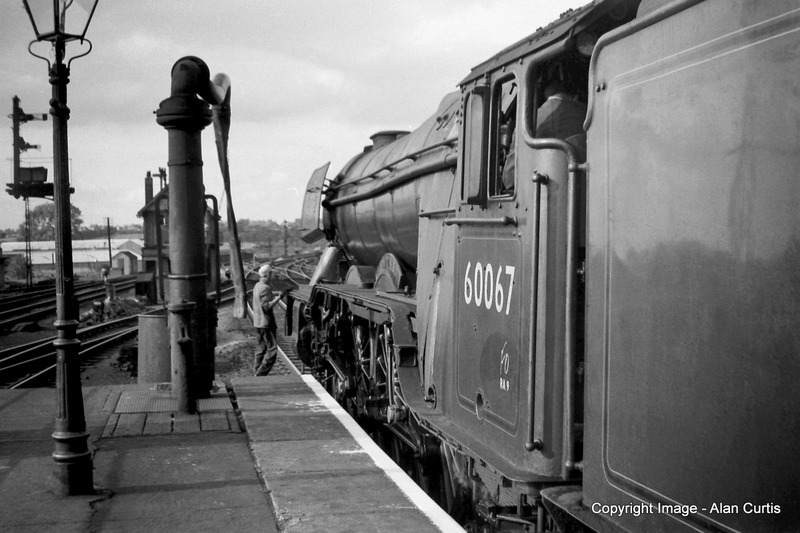 Now back at the the north end of the station I manage to get this 3/4 view of A3 No 60048 'Doncaster' Note the small wing plate smoke deflectors fitted on either side of 60048's chimney. These were also fitted to 60055, 60061 and 60112. With lengthening shadows it will soon be time for the journey home. The boiler and cab of A1 No 60128 'Bongrace' are nicely lit by the sun, highlighting the motion and neat rivet work. With the light now fading my last photograph of the day was taken at the north end of Grantham Station. 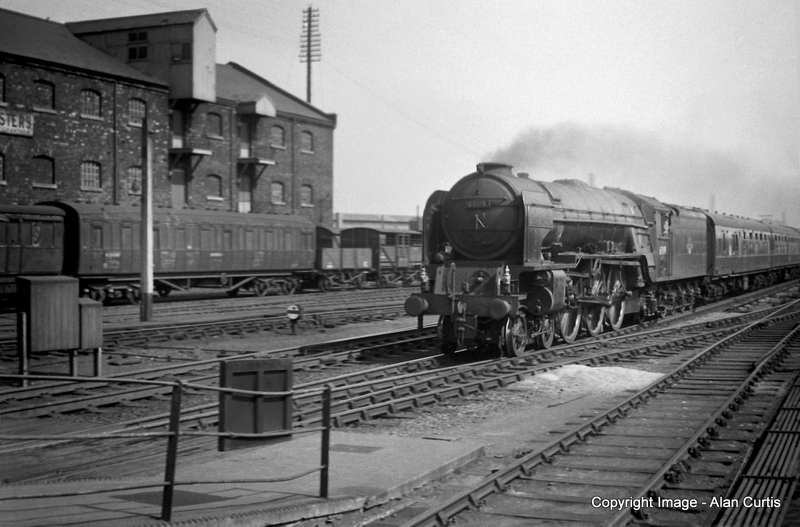 It shows A2 No 60522 'Straight Deal' having just passed Grantham North Box and about to enter the station with an Up train. 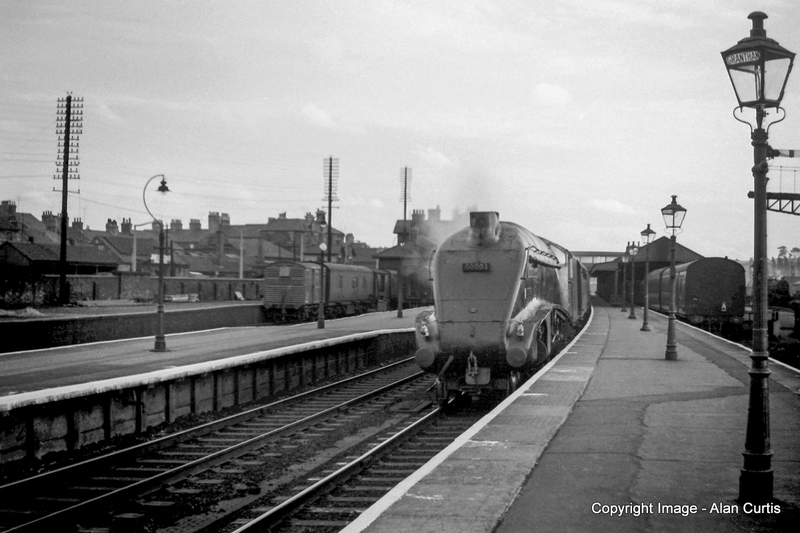 Later in the year I was back at Grantham again with my camera to record the coming and goings over a typical enjoyable visit to the station. 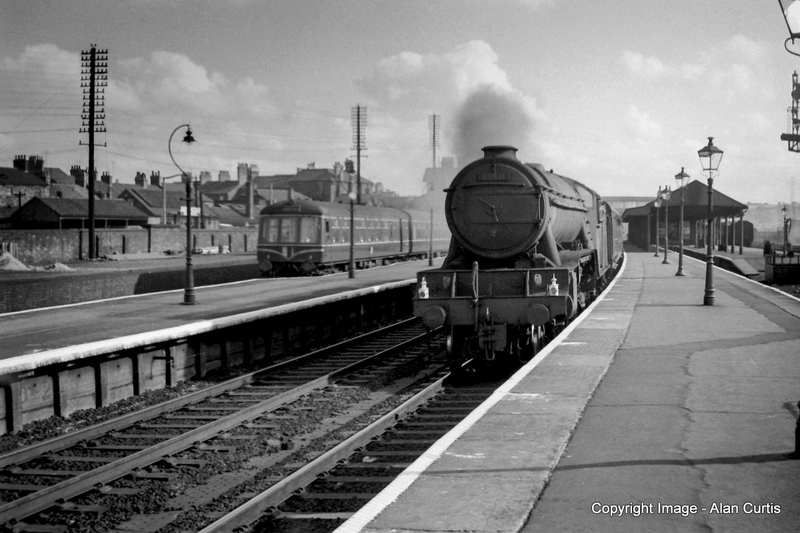 Thursday 28th September 1961. Under an overcast sky A1 No 60144 'King's Courier' has had a good run along the straight from Peascliffe Tunnel. Having now rounded the curve the train coasts into the station. 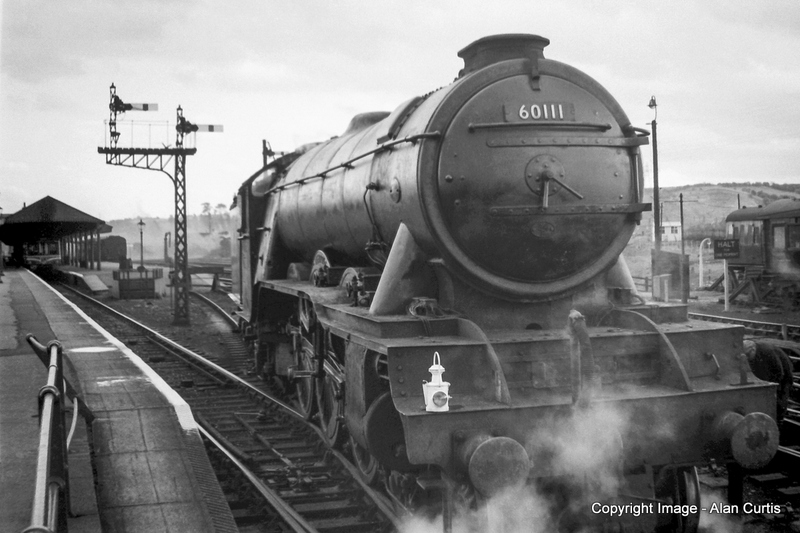 Note the missing glass fitting from the gas lamp and the 'Running In Board' compared to the previous photograph taken in May 1961. I wonder where the board is now? With A2 'King's Courier' safely out of the way and probably nearing High Dyke, Class 02 No 63964 crosses over onto the Up fast with an unbraked through freight. Another freight train trundles through the station on the Up fast, this time hauled by K3/3 No 61873. Hopefully the sun will come out soon! 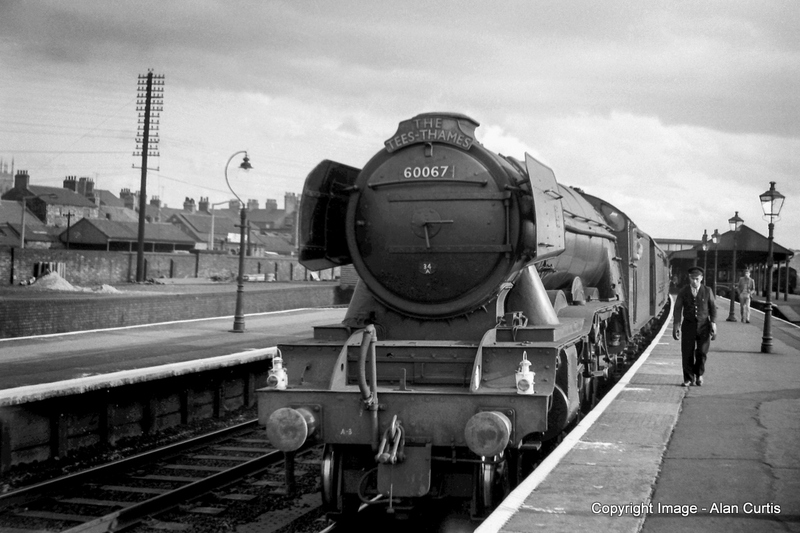 It's starting to brighten up as A3 No 60063 'Isinglass' heads north with an express passenger train. Note the Diesel Unit lurking in the shadows in the Bay on the right. 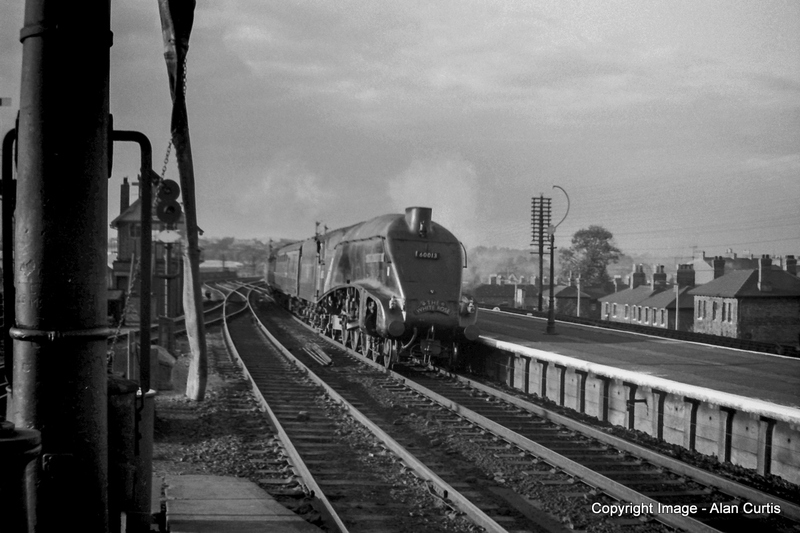 Another A3 No 60112 'St Simon' heads south through the station with a loaded ballast train. 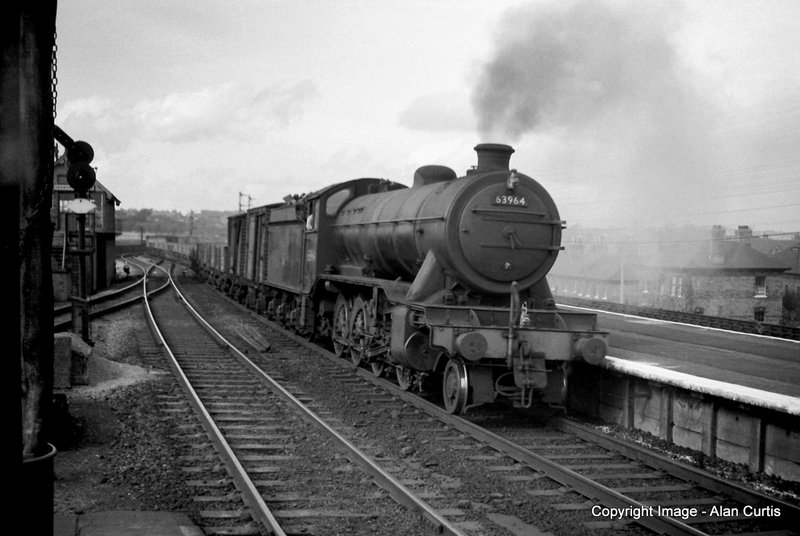 Meanwhile in the yard A3 No 60111 'Enterprise' is seen coming off shed in readiness to take over a northbound train. 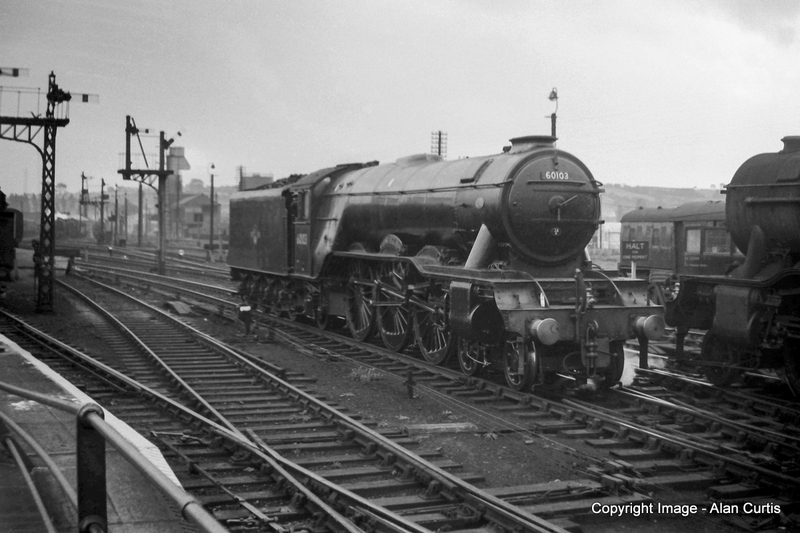 A3 No 60111 'Enterprise' slowly moves forward as part of the well practised sequence for planned engine changes. Up close and personal, A3 No 60111 'Enterprise' reversing into the engine spur to await the arrival of the train it is booked to take forward. A low vantage point again. 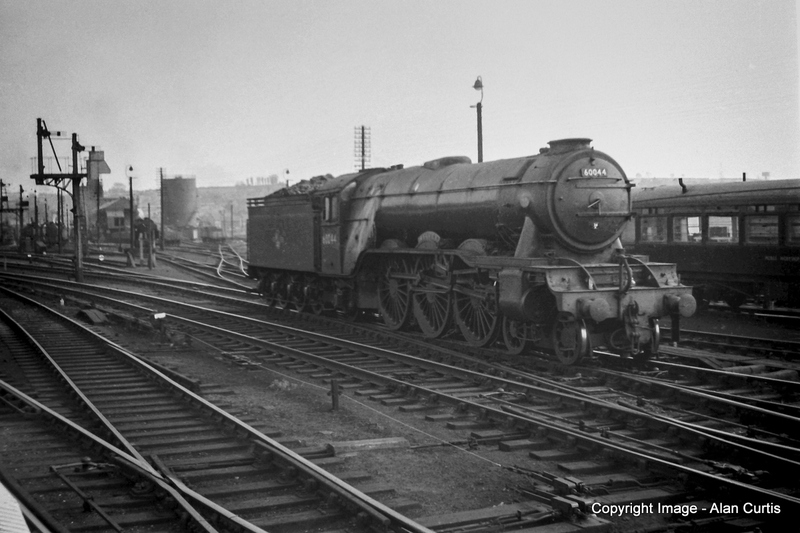 The crew of A3 No 60111 'Enterprise' prepare to continue their journey north with an express passenger train. Ready and waiting for the off. 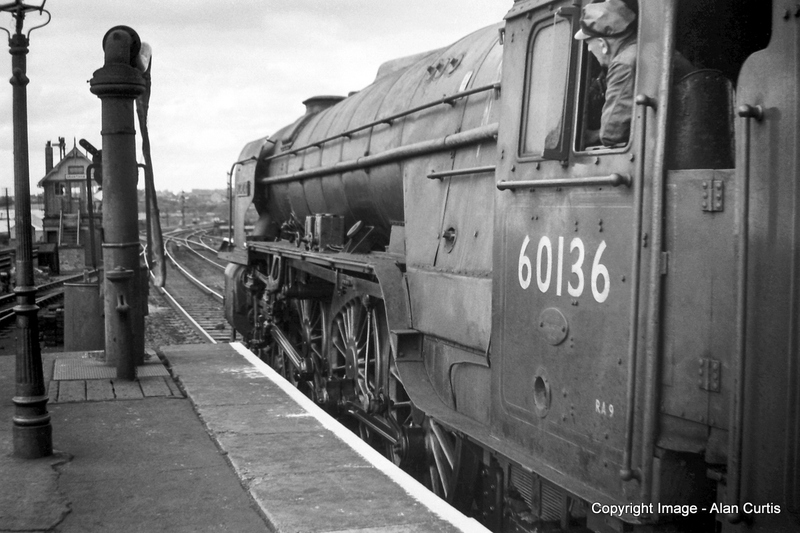 A3 No 60111 'Enterprise' simmers at the north end of the station whilst Grantham driver Ernie Woollatt looks back in anticipation of the whistle. With A3 60111 'Enterprise' having now departed, Class 9F No 92041 passes through the station with a northbound express freight. 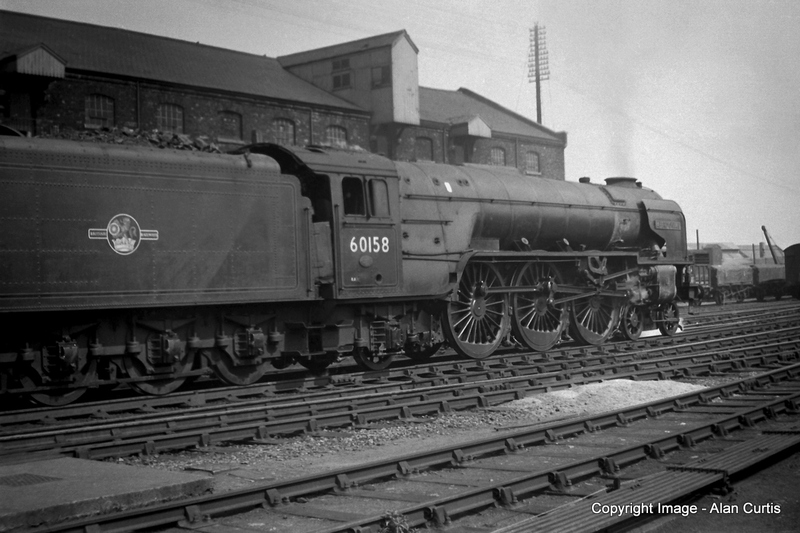 V2 No 60869 potters about in the yard at the western side of the station. A gaggle of fellow spotters watch A1 No 60136 'Alcazar' slowing for a stop with another northbound express passenger train. 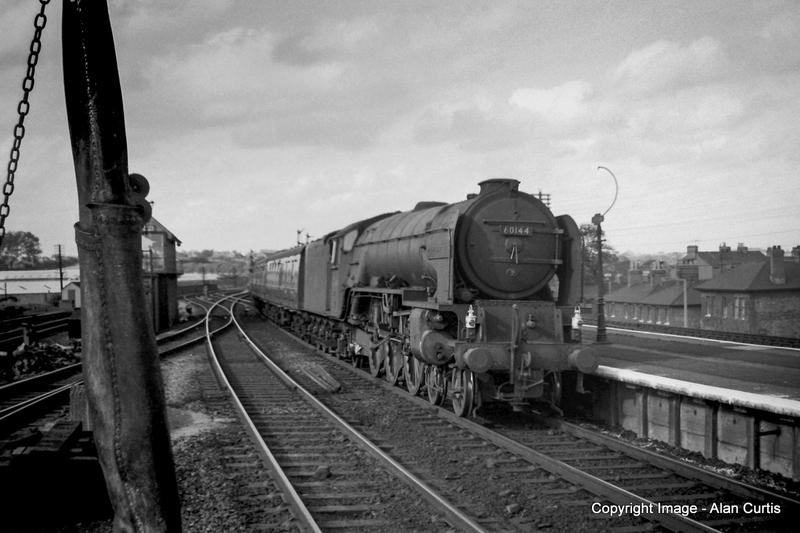 Having now come to a halt at the north end of the station, the driver of 60136 'Alcazar waits for the road. 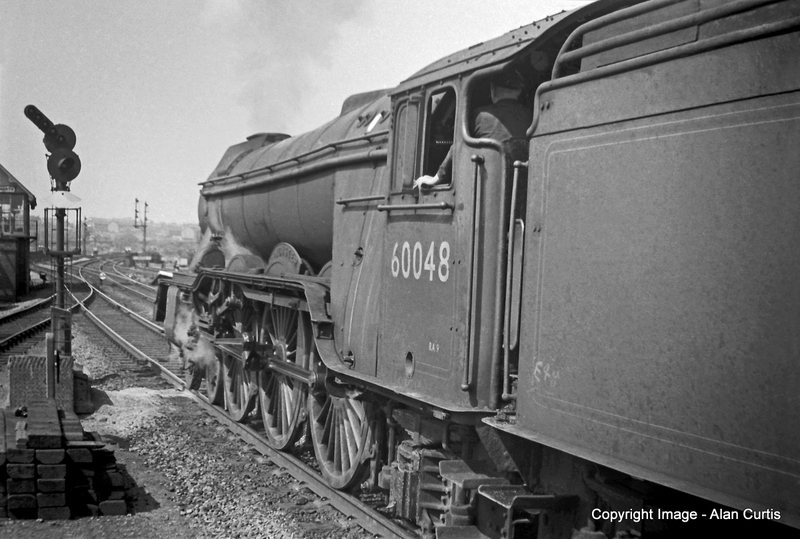 Next up A3 No 60067 'Ladas' stands at the head of the 'Tees-Thames. A bit of a quiet spell now, but in a short time I am able to get a photograph of Class K1 No 62015 running light engine through the station on the Down line. 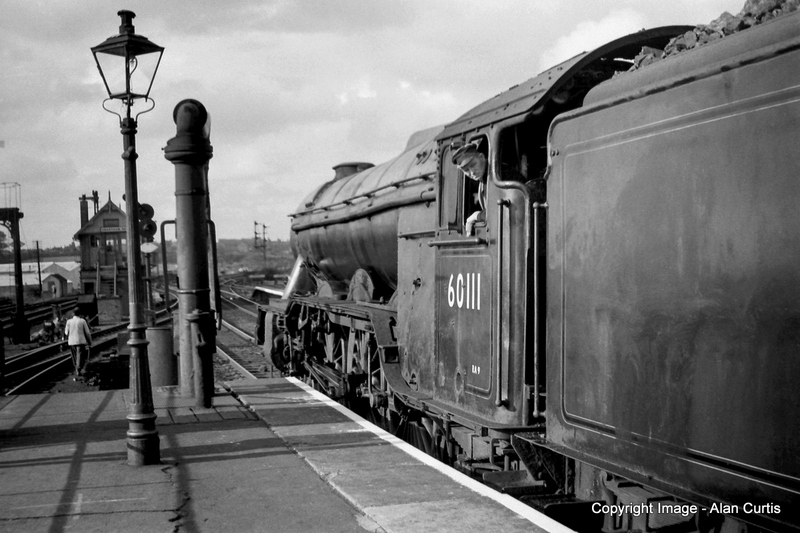 Over on the western side of the station A3 No 60103 'Flying Scotsman' ambles about between duties. A distant whistle alerts me to another train approaching from the north. I have plenty of time to get in position and take this shot of A3 No 60039 'Sandwich' bearing down on the station with an Up express. It's getting towards the end of my visit and with the platform almost to myself I take a quick shot of A4 60003 'Andrew K McCosh' tearing through the station on its way northwards. A scene of relative tranquillity is shattered by the arrival of V2 No 60881 storming through the station with a Down express, while over in the Bay a Lincoln Diesel Multiple Unit sits quietly awaiting its next trip. My last photograph of the day sees A2 60121 'Silurian' next to the ramp leading up to the old coaling stage. It's time to head back home after a most enjoyable day. I hope you enjoyed it too. 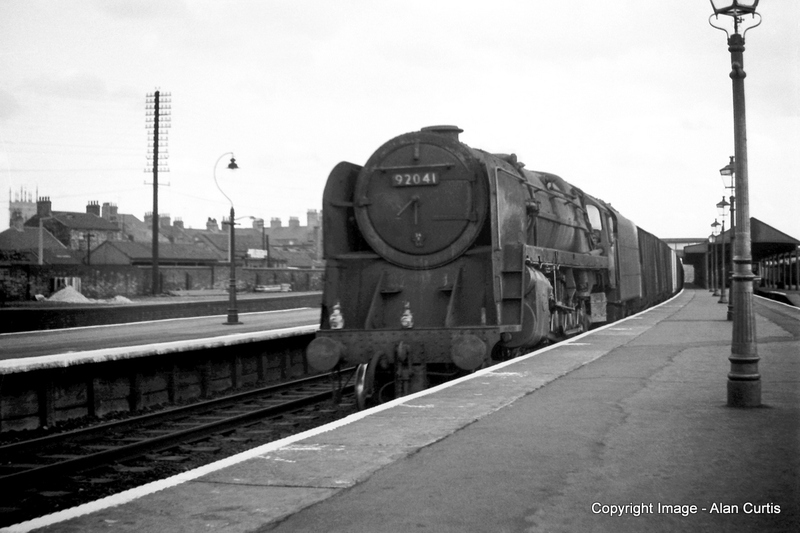 Look out for further articles soon to be published on this website about Alan's pictorial railway memories. Theses will focus on his trips further south to Great Ponton and Stoke Summit. They are currently being put together, but if you want to be notified as soon as they appear on the website, then why not subscribe? By subscribing (It's free) you'll also be kept right up to date by email on all other new features and articles the minute they are published. Well remembered some of the locomotives mentioned, I would have seen them (as I remember?) 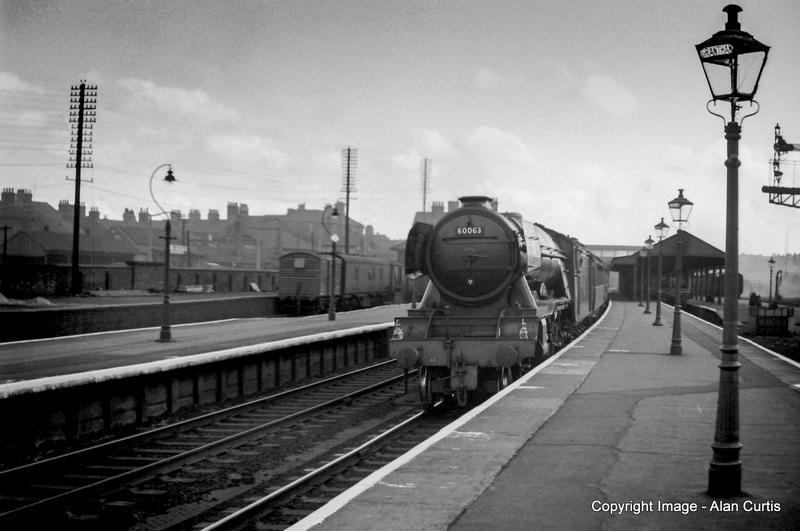 at York sometime, spotted from the Navesmere platform close to the bailey bridge on the Holgate Road. I could not afford a camera, and these pictures are just so clear and very well composed, with a bit of "human element" which gives the natural interest to the photographs. Particularly interesting to me are two bits of infrastructure we can see in the photos. The first is the double banner repeating signals situated on the north end of the Up platform, as the signals at the south end were not visible at a distance owing to line curvature. This is particularly interesting as this arrangement was not perpetuated when the station was resignalled with colour lights, leaving a legacy to this day of drivers 'searching' for the signal if they have received a single yellow aspect in rear - with consequent very slow running. Well that was an improvement, then! The second item is the bay platform on the Up side at the north end of the station, which is nowadays occupied by the Grantham interlocking / equipment buildings and the staff car park. We can see that there appear to be two lines here - a dock for wagons further from the main lines and then the platform line. But the platform line curves part way along where the dock line ends, with the two tracks becoming one, a rather unusual arrangement to make use of the limited space. Fascinating to see how much track infrastructure has disappeared. 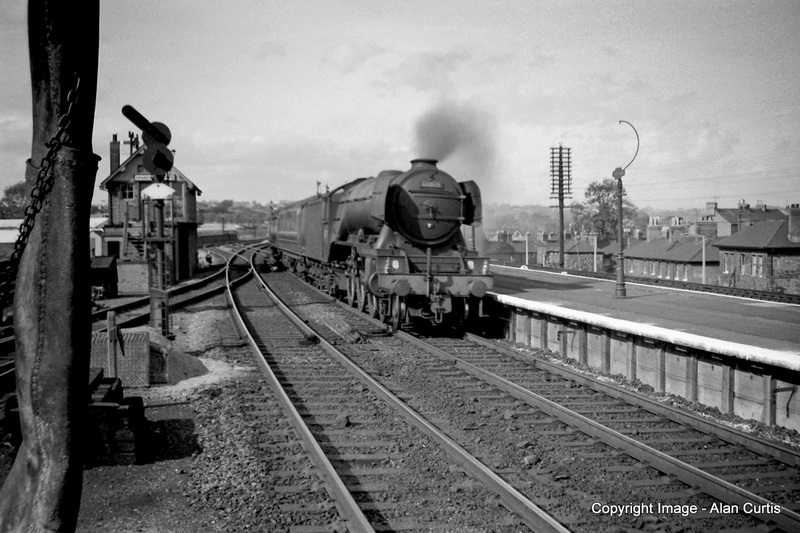 Thanks for pointing out that the lack of the banner repeating signals on the north end of the Up platform has been a hindrance to the efficient operation of the Up Main line through the curved platforms at Grantham - probably since 1972, when mechanical signalling ended. One of the banner repeating signals is 'caught in the act' of returning to the 'on' position in a short film on this page - the Everyday Scenes clip: keep a sharp eye on the signal as the vans behind the B1 pass by. These banner repeaters were were installed when the semaphore signals at the Yard Box which controlled the junction with the Up Goods line (and had co-acting arms at high level that were visible above the station buildings), were replaced by a single-aspect colour light signal sometime in the early/mid-1950s. That signal was itself replaced with a multiple-aspect signal in 1972 when the Grantham panel box opened in the former Yard Box building. I expect it was then that the banner repeaters were removed. Your second point about the layout of the tracks serving the old Platform 1 and associated goods platform and dock potentially opens up a chapter on the history of that part of the station. Briefly, early in 1945 the Up Main Line / Up Bay platform was extended northward by about 100 yards to cope with longer trains on the main line. As a result, a trailing connection connection to the Main line was abolished (it's visible in the 3rd photograph on this page), and the space available for the connections required between the bay platform line and two parallel 'double ended' sidings which lay behind it became very constrained. Consequently, the platform itself was 'necked' in plan. Its width reduced initially and then widened again towards the ramp at the north end, as can be seen in several aerial photographs. Thanks for your comments and kind words on our page about Alan's trips to Grantham. We will certainly pass these on to him. We do encourage and rely on people like Alan to allow us to use their photographs and memories on our website. 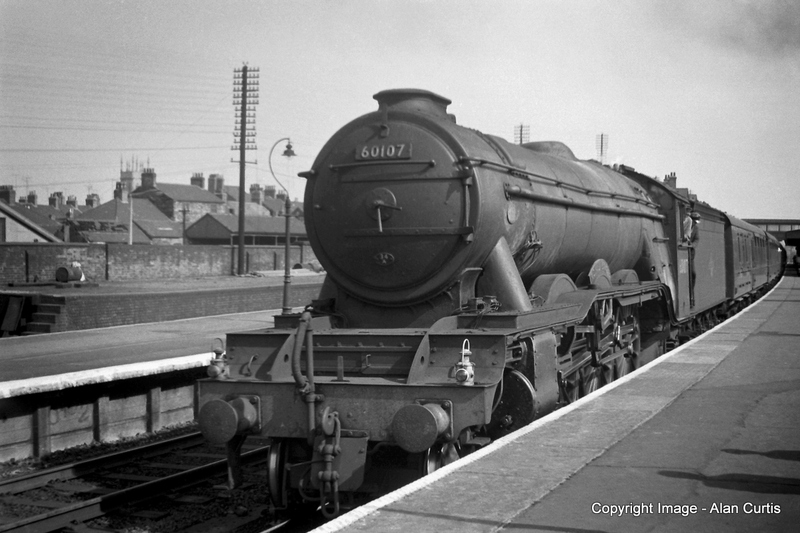 The website is very much a record of the railway scene at Grantham over the years so we hope you will enjoy reading others sections too. Please do look out for further pages about Alan's trips to the area which we hope to put on the website in early 2019. Loved Grantham! As mentioned earlier, as a 12 year old. 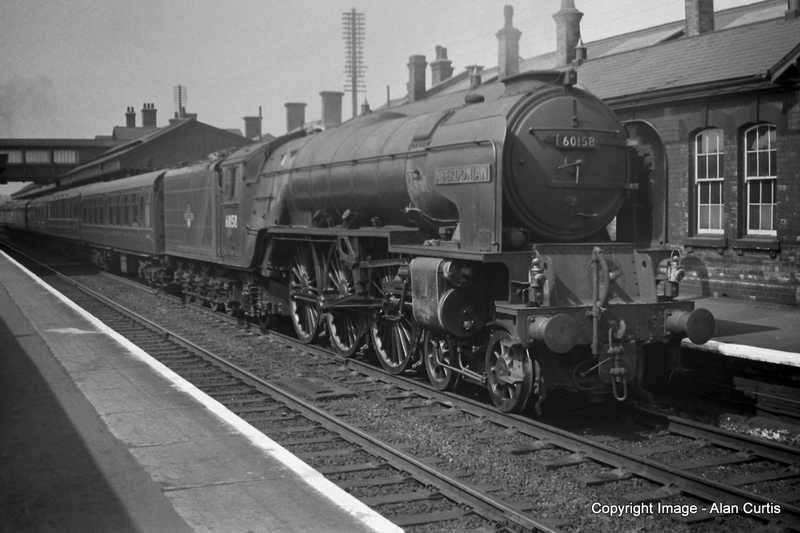 A town smaller than my then home, Nuneaton, but what a surprise I witnessed when stepping off the Nottingham train and viewing the 34F loco yard; 1961 was the year - so much atmosphere! Copped 14 namers on my first visit and I still remember names and numbes 54 years on. I visited many more locations in the 1960s, like many more of us boys then keen to cross of as many numbers as possible in our ABCs. I still have them all. 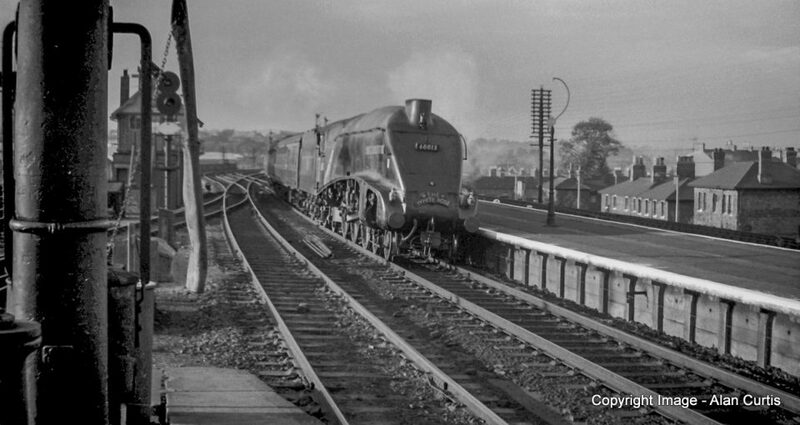 We were lucky to witness those days - nothing compares today though I still visit preserved railways regularly, hanging on to the steam railway scene. 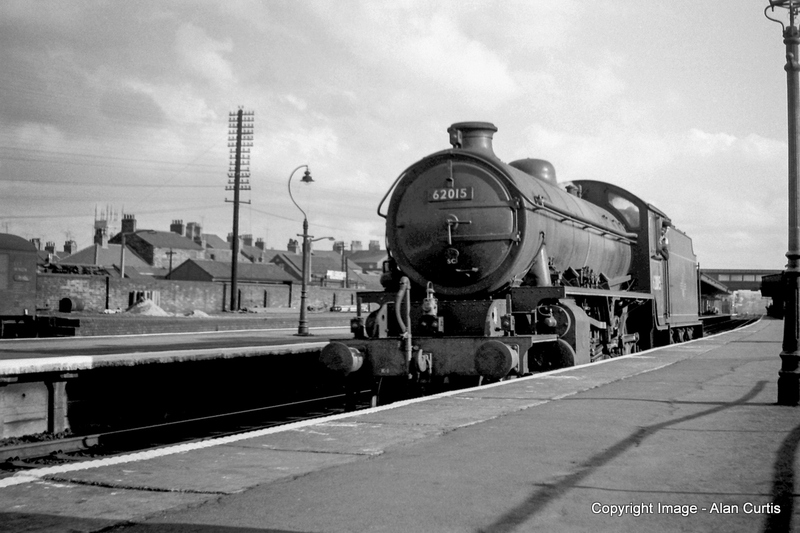 Thank you very much for sending in your own impressions of Grantham from 1961. 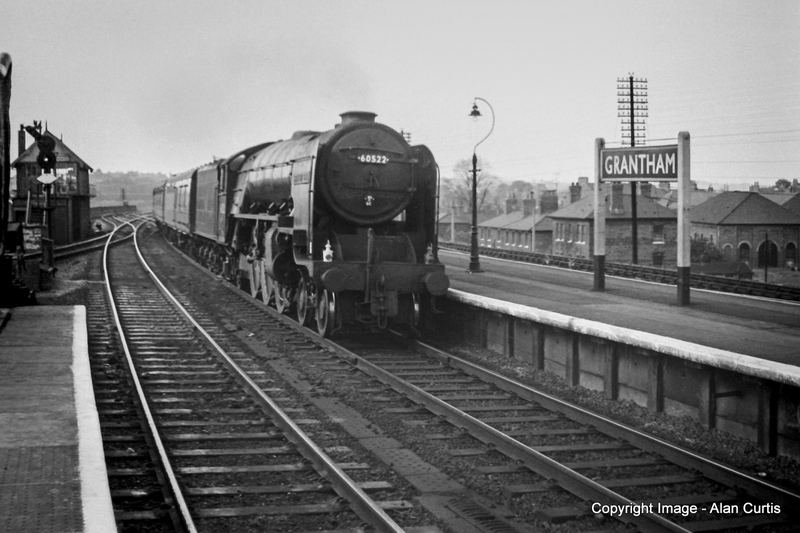 Our contributors have been very generous in sharing photographs of what they experienced and I know that they appreciate it, as do we who look after Tracks through Grantham, when we receive responses describing so vividly how it felt to be there all those years ago.